You are currently browsing the archives for the tag 'aesop'. To be honest, this might not be the sexiest post, but on the other side what is sexier than lean legs and a beautiful smile?! Here are two new products that you will surely like, both made with natural ingredients. 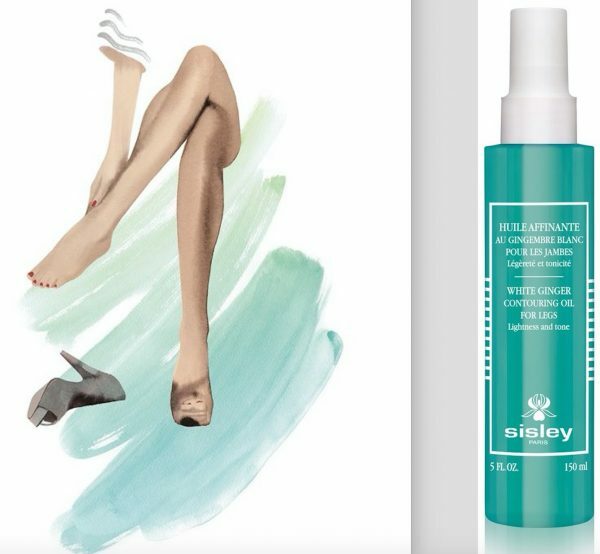 This amazing oil is the key to smooth and slender legs. Its nourishing formula is enriched with White Ginger and Gingko Biloba that help to drain swollen tissues, as well as Red Algae extract and Gelidium Cartilagineum that promote the dissolving and burning of fat. The addition of Rosemary and Litsea Cubeba essential oils helps to firm and tone your skin. Formulated with hydrating Shea and Macadamia. 1. Apply from the arch of the foot, moving up with circular movements around the ankles with your fingertips. 2. Then massage the calf by lightly stroking with one hand after the other, moving up from the ankle towards the knee, then go around the knee, pressing firmly with an upward motion to stimulate draining. 3. Repeat the same action on the thigh, starting at the knee and moving up to the top of the buttock. 4. Follow with large, firm, circular movements with the palms of both hands, moving up from the knee towards the buttock and hip. Repeat this technique three times on each leg. Whether it’s part of the global wave of new naturals taking over the beauty realm or fluoride’s classification as a neurotoxin (shocking as it sounds, it is the same category that lead, arsenic, and methylmercury fall into) this year, there’s no denying that natural toothpastes are having a moment. So let me present you Aesop’s latest launch that has been developed to maintain impeccable oral hygiene. Distinctly flavored, this toothpaste effectively cleans teeth and gums while essential oils of Anise, Spearmint and Clove provide an eclectic taste alternative to traditional selections. A fluoride-free formulation, it includes soothing Sea Buckthorn to lessen gum aggravation from frequent and vigorous brushing, while Cardamom and Wasabia Japonica help to maintain fresh breath. Taking about body odor is not a pleasant topic, but it can’t be ignored. But the idea that ingredients in deodorants, namely aluminum, can cause breast cancer has been scaring me for a while. I mean, it makes sense, applying something so chemical-heavy near that part of our body certainly does give me chills. Therefore I had been looking for an aluminium-free deodorant that really keeps me stink free for some time now. 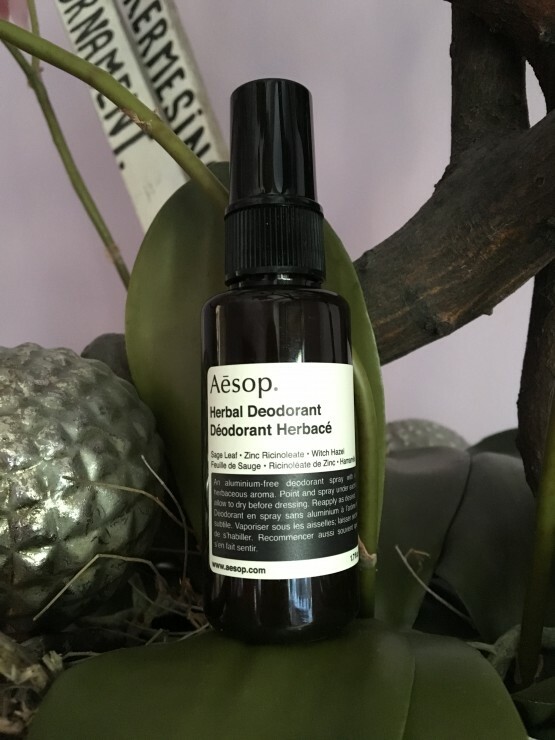 And finally I have found one that I like: the Herbal Deodorant by AESOP, a botanically based product created for everyday use, which is suitable for men and women alike. Its formulation contains zinc ricinoleate to help address compounds associated with coryneform bacteria – the main contributor to strong body odour – and a considered blend of essential oils, including rosemary, sage and eucalyptus. These ingredients also impart a refreshing residual aroma that complements our cleansing and hydrating preparations for the body. Herbal Deodorant is available at signature stores, counters in select department stores, and at Aesop online for CHF 35.00 (50ml). My first step of a beauty routine is the calming scent of a candle. This one I love. 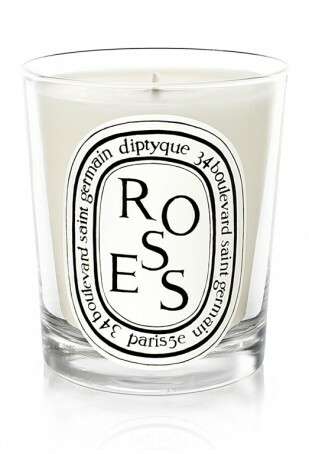 Its delicate aroma of white rose and jasmine, inspired by the Fornasetti gardens in Milan is divine. I like to keep the ceramic vessel to store jewelry and small trinkets. Lightweight and beautifully scented, this serum is the quickest way to a fresh and youthful glow. Fragranced with Rose Damascene Flower Oil and enriched with softening botanicals, it’s the perfect shower gel that will envelop you with a feeling of well-being and help to keep you focused through even the most manic of days. My personal daily essential. The signature formula is enriched with softening Rose Flower Essential Wax and healing Shea Butter, simply dab it on to instantly soothe and plump your lips. 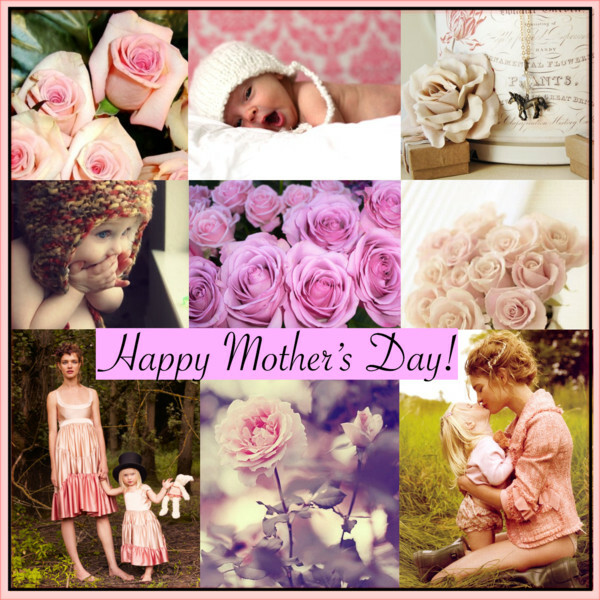 This Sunday is Mother’s Day and it is still not too late to find the perfect gift for your beloved mum. Instead of giving a bouquet of roses have you ever thought of giving roses in a tube? (For my Zurich based readers, most products are available at Osswald and Jelmoli). This rich conditioning treatment restores vitality and shine to all hair types with active ingredients of rose petals and lavender stems. It is to be used on the hair and scalp once a week for half an hour. Should hair be extremely dehydrated, it can be left on overnight. This masque is suited to all types of hair but ideal for dry, brittle or coloured hair. The deep conditioning leaves hair soft, lustrous and moisturised; dry and flaky scalps will be soothed and hydrated. Crème de Rose is an essential nourishing and smoothing lip balm with a delicate rose fragrance that is simply addictive! It is enriched with a rare and precious Damask Rose essential oil extract, an anti-aging complex, energizing vitamins A and E, and shea butter for a long-lasting regenerating and smoothing anti-wrinkle effect. It leaves the lips optimally soothed, moisturized and nourished. 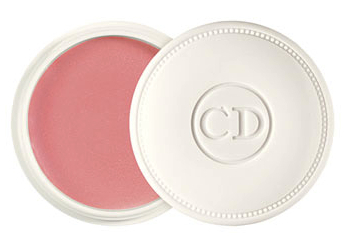 Soft and beautifully plump, the lips are more radiant than ever! By Terry has created a chic and practical crystal case for their must-have Rose Balm which hydrates and nourishes the lips. 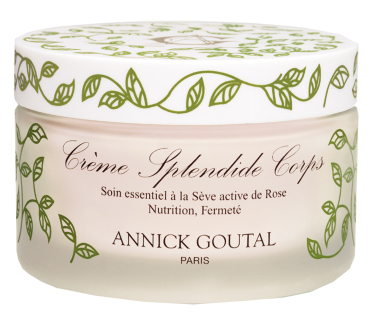 It features an extremely high concentration of lipid-building substances and essential rose wax. The formula is a rejuvenating, reparative, strengthening, nourishing and anti-ageing treatment that enhances the voluptuousness of the lips and leaves them radiant with the glow of health! Composed of seven types of roses from around the world, Red Roses is a surprisingly clean, voluptuous scent. With a heart of crushed violet leaves and hints of lemon and spearmint, it unfolds like a bouquet of fresh-cut flowers. 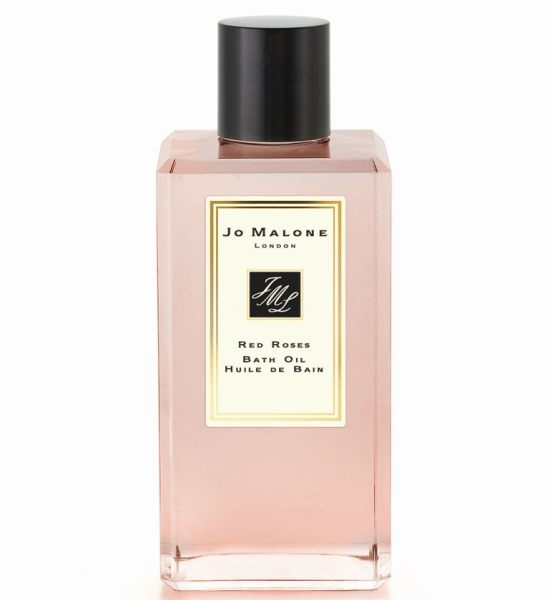 Red Roses Bath Oil gently fragrances and moisturises the skin. Lush and softly foaming, it’s pure relaxation. Nutrition and firmness for all skin types. 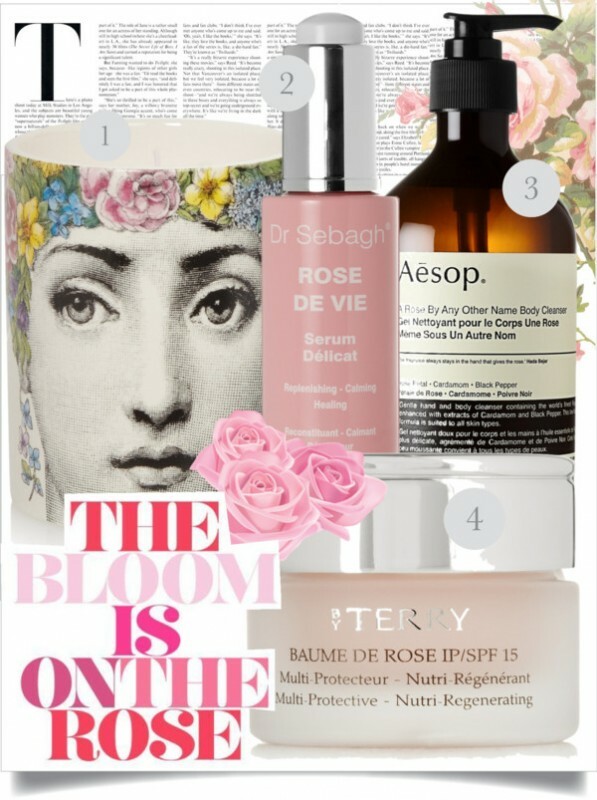 Highly concentrated in phyto-energizing active ingredients, caffeine and Active Rose Serum, Crème Splendide Corps nourishes, tones, firms and leaves skin satin-soft. Its luxurious, sumptuous texture and its fresh rose-like fragrance of morning dew win is seductive and irresistible. Rich in precious oils such as the oil of macadamia, and jojoba, this cream nourishes the skin in leaving it toned and soft like satin. It is a genuine, youth-promoting curative treatment which stimulates cellular renewal. I am completely addicted to the body cream. A wonderful, intensive, floral bouquet with rose as the leading role in the center. 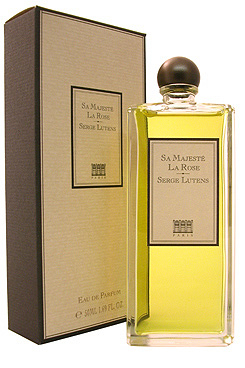 For this fragrance, Serge Lutens combined Her Highness, the Rose, with fresh, green, opening notes, spices and woody notes in the base. For a previous interview with the famous perfumer, please click here. This beautiful scented candle recalls an armful of tender, changing roses that lightly evoke the world’s most universally loved flowers. Ladies and Gentlemen, this is no April fool! It’s not often that a beauty product leaves me lost for words but this one truly did. 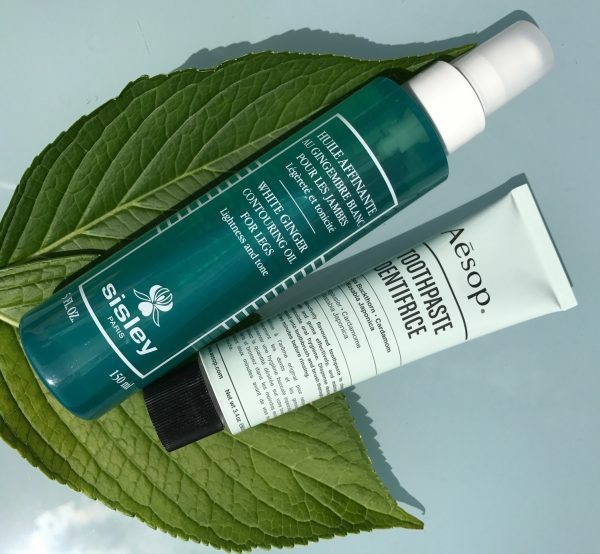 Cult beauty brand Aesop and French trend store A.P.C. have teamed up for their second collaboration following their Fine Fabric Care detergent. Introducing their… no joke… Post-Poo Drops, a bathroom “deodoriser best suited for use by those who eat, drink and digest daily.” The drops will be available in store from April 1 for CHF 37.- (100ml). Hilarious! Wouldn’t that be a thoughtful hostess gift idea for your next spicy dinner invitation? !